The discussion featured panelists from Bangladesh, Cambodia, Mongolia, Myanmar, Nepal and the Philippines, including PTF-Asia President Geert van der Linden, who presented their experiences in engaging with government authorities at local, state and national levels. Through their presentations, they offered views on good practices in sustaining citizen engagement with governments. The Roundtable comes at an opportune time as the Asian Development Bank and Open Government Partnership (OGP), a multilateral initiative that aims to secure concrete commitments from governments to fight corruption and improve governance, have recently agreed to work together to support transparency, accountability and participation efforts in East Asia. 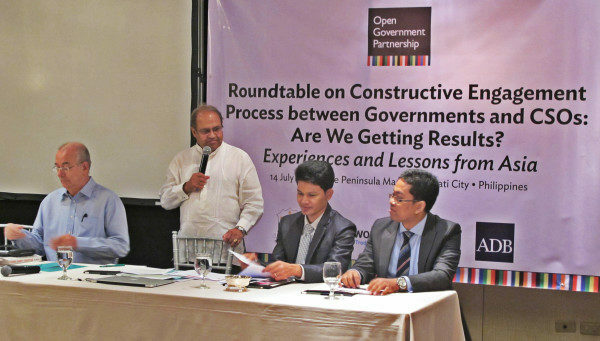 The ADB’s support will focus on exploring opportunities to provide technical and financial assistance to help countries meet OGP eligibility criteria and to develop and implement OGP action plans.